At the entrance of the Legends Mall by the Sparks Marina. If you live in Sparks, you know that it's happening here! When you need to find a place to eat and drink where things are still happening, check out BJ's Restaurant & Brewhouse! 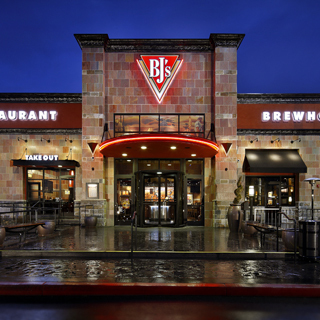 BJ's has been serving great food to Southern California for years, and now we're proud to serve the people of Nevada. We recommend beginning your meal with one of our Shareable Appetizers, then trying our BJ's Signature Deep Dish Pizza, available in many mouth-watering varieties like Chicken Bacon Ranch pizza, Gourmet Five Meat pizza, and Vegetarian pizza. If you're not in the mood for pizza, that's no problem at all: our menu is huge, and packed with great choices like our House Top Sirloin steak, Fresh Atlantic Salmon, Santa Fe Salad, Mahi Mahi Tacos, and our Crispy Jalapeno Burger. And that's just the beginning--there are many more delicious entrees to explore. Just make sure that you save room for dessert, so you can try our Pizookie! But it's not just food that we offer--BJ's Restaurant & Brewhouse offers a variety of delicious beers that are handcrafted by our team of brewers to be consistently delicious and always available. Whether you like crisp, refreshing beers like our Brewhouse Blonde, or dark and powerful beers like our Tatonka Stout--or anything in between--you'll be sure to find something you enjoy. We also have a great selection of seasonal beers and limited edition beers, so you can come in often and still try something new! The atmosphere at BJ's is also perfect for all kinds of activities, from sitting at the bar and watching TV to having a party with a big group of people. Stop by today, and experience all that's happening at BJ's Restaurant & Brewhouse! Sparks is an up and coming tech town with the recent additions of Amazon and the Tesla Gigafactory. Our restaurant is a local favorite for both Sparks families and professionals. While one of the busiest restaurants in town, we deliver excellent food and service that consistently exceeds our guest's expectations.